Leovet Power Phaser Fly Repellent offers total protection against all biting and non-biting flies, horses flies and ticks. 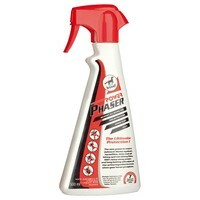 Developed with an optimised blend of active ingredients that guarantees long-lasting effectiveness for up to 7 hours, Power Phaser Spray will continue to provide ultimate protection even if your horse manages to work up a sweat and perspire. Evenly spray on at close range avoiding contact with the eyes and all mucous membranes. It is very gentle on the skin.